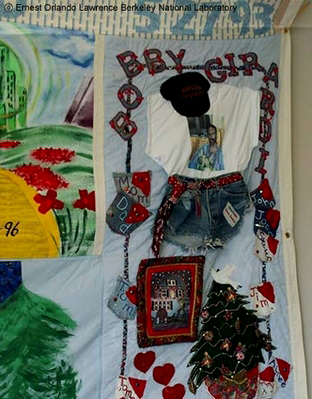 I can still remember the moment I saw a section of the traveling AIDS Memorial Quilt on display at my high school. I hated it. My classmates admired the patchwork, studying the names and pictures of AIDS victims from all walks of life. As they remarked how the quilt heightened their awareness of the magnitude of the AIDS epidemic, I vowed never to have anything to do with it because it reminded me of my estranged father who had contracted the virus through intravenous drug use, a sure death sentence in 1995. Knowing that my father still got high and shot up knowing he had AIDS, I feared that he would become a statistic and have his picture plastered on this stupid quilt, too. I was so ashamed that my father had AIDS. In addition to my feelings regarding my father’s illness, I also harbored resentment and anger towards him for abandoning me when I was three years old. When I was mature enough to understand, my mother told me why my father left us. He already had a family. In fact, he had a wife and three children across town. To make matters worse, he impregnated my mother and his wife around the same time. My brother and I were born only three weeks apart. This news devastated me because I started thinking of myself as a big mistake—a child from an affair. Consequently, I struggled with my identity because my father’s family did not accept me as his child causing me to feel as though I didn’t belong anywhere. Many times I would question why I still yearned for a relationship with my father knowing how much pain he had caused my family and me. I can still remember those times during the early eighties when my father became addicted to drugs and grew violent towards my mother. One night he flushed my mother’s head down the toilet and stabbed her. After my father’s rage ended that evening, my mother packed my siblings and me up and we ran away. We marched down the urine stained stairs of our apartment building in a single file line. “Don’t touch anything!” my mother warned. Once outside, we huddled around her legs and walked briskly, almost jogging, out of our housing project complex at two o’clock that morning. It was cold and bitter. The snow crunched under our feet as we marched for two miles to Aunt Renee’s house for shelter. Like the stinging wind that whipped across my face that frightening evening, those early memories of my father stung for many years. I coped with my father and his illness by pushing him to the corners of my mind. It was convenient, but deep down inside I knew it was spiteful. Although I tried forgetting about him over the years, my father weighed heavily upon my mind during my final semester at Duke University in 2001. A part of me felt betrayed and wanted nothing to do with him. But another part of me felt a strong need to forgive him, only I didn’t know how to do so. After prayer, receiving counseling, and reading Alice Walker’s book The Color Purple for a class assignment in college, I realized it was possible to forgive my father. The character “Mister”, who was violent and abusive towards his wife, Celie, reminded me of my father. I used to think of “Mister” as a monster, but I changed my view of him after I rewatched the film with my class and realized that “Mister” had self esteem issues and didn’t know how to love. He needed help just like my father. Although “Mister” mistreated Celie, she still found the courage to forgive him. I ultimately found the courage to forgive my father and release years of resentment. I learned that forgiveness was the only way I could be free. In 2001, after I graduated from Duke, my father passed away. We never talked face to face or made amends, but I had forgiven him in my heart. As I reflect upon his death I realize that I wasted valuable time judging him. Although he caused much pain in my life, I decided to dwell upon the good in him. It has been 14 years since I first saw the AIDS Memorial Quilt and nine years since my father’s death. In remembrance of him, I considering making a panel for the AIDS quilt for him. I did some research and learned that the instructions were simple with few restrictions. The panel should include the name and date of birth of your loved one. The dimensions must be three feet by six feet with a two to three inch border for a hem. The use of a durable fabric like cotton is strongly suggested while the use of glue is discouraged because it does not last long. I think I’ll make a collage of fond memories against a black background. I think I’ll add images of a pair of roller skates, a shiny fifty cents piece, the Duke Chapel and pictures of my father and both of my families. The pair of roller skates will represent the times my father made me skate from South Philly to North Philly and back. He didn’t believe in public transportation and would rather roller skate everywhere. Although I hated skating with him, I became a great skater. The shiny fifty cents piece will represent the times my father taught me how to read. He’d give me a shiny fifty cents piece every time I finished a book. (When all was said and done, I was a rich three-year- old!) The Duke Chapel will recognize my father as the reason why I was the first in my family to graduate from college. He instilled the value of education in me at an early age. Finally, the pictures of my father and both families will represent my acceptance of my family circumstances and a strong declaration that my birth was not a mistake. My AIDS quilt panel will represent a twelve year journey of forgiveness, acceptance and the triumph of perfect love that knows no fear. I now view the AIDS Memorial Quilt as a tool for teaching people how to understand, accept and remember everyone affected by the AIDS virus. 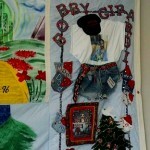 Please visit www.aidsquilt.org to find out more information about the Aids Memorial Quilt. P.S.- Remember, everything has beauty including YOU. It just takles a true D.I.V.A to see it! Thank you for sharing this, Shalena. Your transparency and honesty are much appreciated. We’ve all got a story to tell, and our stories are as unique as we are. Thanks again. Thank you for sharing Shalena. I too, had a very conflicted relationship with my father. He passed away and I was not told until 6 months after the fact. I still struggle with the conversations that I will never get to have and the questions that I will never get to answer. It is great to see someone who has moved past the pain into forgiveness. Shalena this article was very touching, I thank God for allowing you to triumph. Just by going through your storm God gave you a platform to allow others to express there struggles. So thank you..